Distinguishing elements of traditional architecture can be identified in the traditional Arabic house around various parts of the Arab world. The astonishing traditional houses of ancient Cairo, the charming houses in old Kuwaiti Fareejs, the spacious courtyards of traditional houses in Damascus and the wind-catchers of the houses in Dubai’s Bastakia district are all examples of how architecturally forward the traditional Arabic house was. The traditional Arabic house in each country takes its structure and design from the traditions, habits, and culture of the country nationals. However, the designs of these houses shared some common architectural elements due to the climate of the region and the mutual religious needs. All traditional Arabic houses shared a subtle beauty as well, and a cozy atmosphere. So let’s take a look at the architecture and design of the traditional Arabic house across some Arab countries. Most of the regions in the Arab world such as the GCC area, Iraq, and south Egypt are hot dry zones. That is why, unlike European houses which are mostly open to allow the maximum amount of the sun and heat to enter the house, the Arab house is introverted. This means that the daily life in the traditional Arabic house looked inside into a courtyard rather than looking outside to a front garden overlooking the street. Some of the distinctive architectural elements that were common in the design concept of traditional Arabic houses are, the majaz (entrance), the courtyard, the combination of the qa‘ah (reception area) and the malqaf (wind-catcher), and the mashrabiyyah (wooden lattice bay window). These elements were specifically chosen for climate as well as cultural reasons. First, the privacy of the family was an integral element that affected the layout of all traditional Arab houses; they are noticeably defined as public, semi-public and private areas. Moreover, the design of the house tended to generate an inward-looking plan with plain external walls. These thick walls were purposefully designed to protect the house from the harsh climate outside. In addition to that, the courtyard was a common element in the design of traditional houses to enhance the air flow and the thermal comfort inside the house. The oldest section in this traditional house was built by Abdel Wahab el Tablawy in 1648 However, the house was purchased in 1796 by Sheikh Ahmed El-Suhaymi, whom the house is named after. El Suhaymi extended the house by incorporating some adjacent houses. 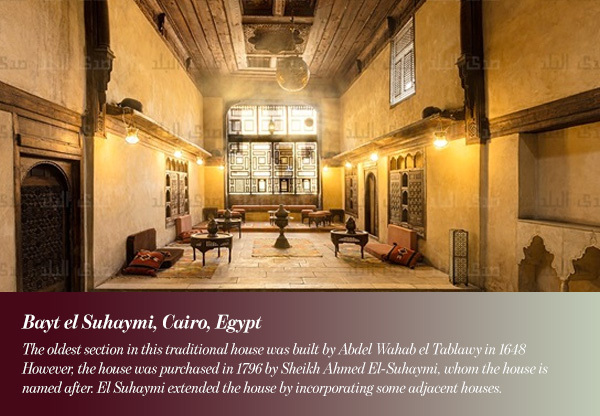 Bayt el Suhaymi is one of the best examples of traditional upscale private houses in seventeenth century Egypt. The house was restored in 1997 under the patronage of the Arab Fund for Economic Development as part of the Bayt El Suhaymi Area Documentation and Restoration. From the outside of the house, several mashrabeya windows can be seen. While from the inside of the house, you can see the Sahn or the courtyard of the house. This spectacular house was constructed around 1800. It is considered one of the optimum examples of a traditional Arab house in the Gulf. The Majlis or chief sitting room downstairs was kept cool in summer by the down draft from the wind tower. The house also features some fine gypsum and woodcarving throughout. The house comprises of numerous rooms arranged around four courtyards. You can easily identify the four sections of the house: Sheikh, family, guests and servants. 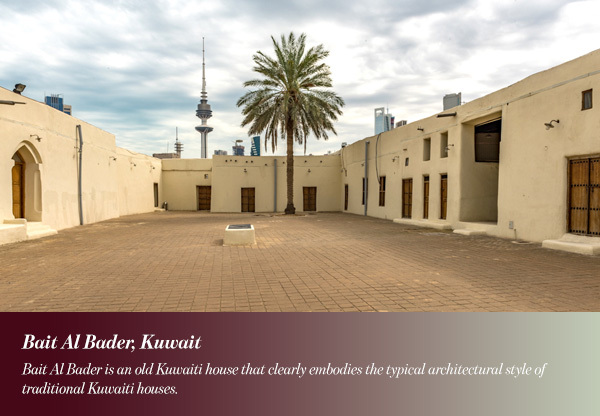 Bait Al Bader is an old Kuwaiti house that clearly embodies the typical architectural style of traditional Kuwaiti houses. The original house was built between 1838 and 1848. It comprises several rooms extending from 5 open courtyards. The house features the famous front doors of old Kuwait as well as a raised ceiling featuring thin rails and palm leaves. Bait Al Bader has been renovated as a heritage house. It is now a part of the national museum used as the exhibitions venue of local handicrafts. 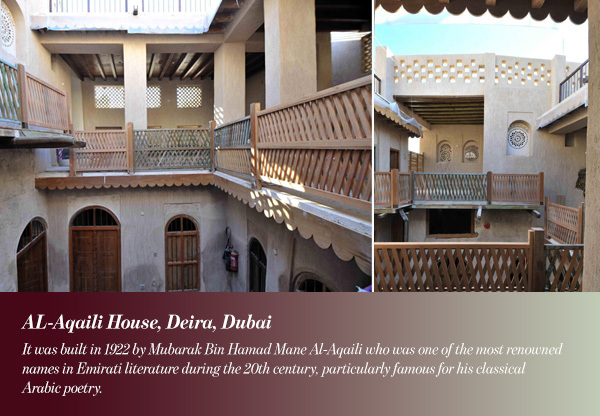 This old house is situated in the heart of the historic area of Deira. 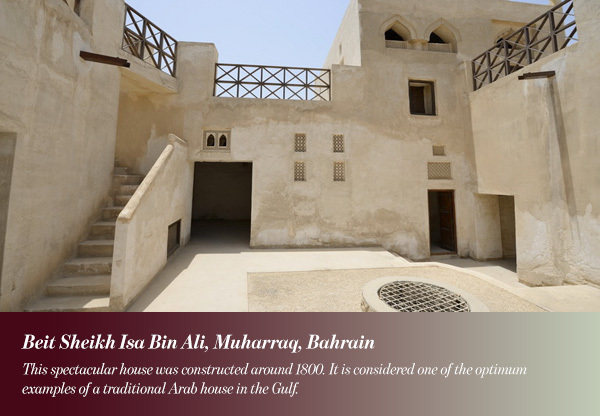 It was built in 1922 by Mubarak Bin Hamad Mane Al-Aqaili who was one of the most renowned names in Emirati literature during the 20th century, particularly famous for his classical Arabic poetry. This house is pretty important not only because it was the home of the late poet, but also because it obviously features traditional Arabic design. The house was restored and converted into a museum in 2010, using local building techniques and traditional materials. The museum features some of the poet’s works and memorabilia on display. 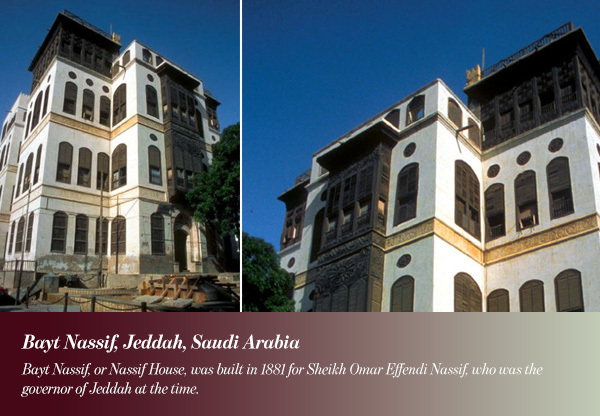 Bayt Nassif, or Nassif House, was built in 1881 for Sheikh Omar Effendi Nassif, who was the governor of Jeddah at the time. Bayt Nassif is considered an important heritage and a famous landmark showing Jeddah’s rich past. This magnificent ancient mansion in Jeddah has gone through extensive renovations. It is currently used as a cultural center housing special exhibits or lectures. The interior of the house resembles traditional Saudi mansions. Going through the 106 rooms of the house you can notice the magnificent art work, including works on wood, works on tiles as well as spectacular Arabic calligraphy. The stairway in the house is a ramp with spaced crossbeams, convenient for animals carrying goods to climb; as in the old days they used trained camels to go up and down the five floors of the building carrying goods.